An American Airlines jet is pushed back from its gate at O'Hare International Airport. Chicago Mayor Rahm Emanuel has reached a long sought-after agreement with two major airlines — United and American — to build a new runway at O&apos;Hare airport. The $1.3 billion project will increase capacity at the congested airfield in hopes of reducing delays. However, the deal does not include an agreement with the airlines to increase terminal space and add new gates, which some travel industry experts say is critical to reducing congestion at O&apos;Hare, an airport notorious among frequent fliers for delays. The new runway will complete a modernization project that began more than a decade ago, changing O&apos;Hare&apos;s configuration from several intersecting runways to a configuration of six parallel, east-to-west runways and two diagonal runways. 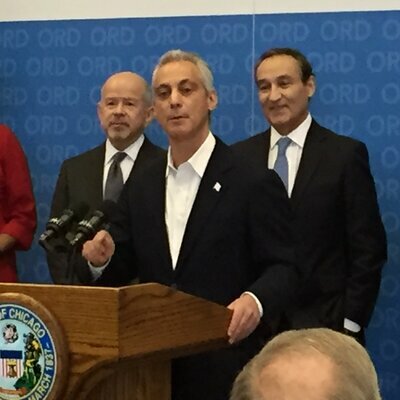 "This new runway that will now be built is one of the final steps in realizing a fully modernized and efficient O&apos;Hare International Airport," said FAA Administrator Michael Huerta at a Sunday news conference at O&apos;Hare announcing the agreement. "When runway 9C/27C is completed, it will allow for arrivals and departures to operate on different runways in the north half of the airport," Huerta said. "And this will enable more on-time operations and greater safety margins for incoming and outgoing aircraft." The building of the new runway and decommissioning of a diagonal runway will allow for construction of a new, more direct taxiway to O&apos;Hare&apos;s terminals, eliminating a long, circuitous and time-consuming journey that many planes now make after landing to get to their gates. The project also calls for constructing deicing pads away from the gates, so planes no longer have to remain at and tie up gates while being deiced in snowy weather. Mayor Emanuel acknowledged that the city in the past has often been too focused on whether O&apos;Hare would surpass Atlanta&apos;s Hartsfield-Jackson International as the nation&apos;s busiest airport. "The measure going forward from now on," Emanuel said Sunday, "is not whether we are the busiest but whether we are the best." "So today, we&apos;re not only laying the groundwork for a 21st-century airport, but it will power a Chicago for the 21st-century economy," the mayor added. For Emanuel, the agreement allowed him to shift away from the rising tensions in the city and continuous controversy over his administration&apos;s handling of the release of dash-cam video showing the fatal shooting of 17-year-old Laquan McDonald by a Chicago police officer. And Emanuel is hoping to spread the wealth from the $1.3 billion infrastructure project to underserved communities in the city. "We&apos;re going to do something different with this investment," he said in laying out how the city will establish contracting rules to allow minorities to gain a significant share of the estimated 5,000 construction and professional services jobs expected to be created by the project. "We&apos;re going to do it in a way where O&apos;Hare is no longer an island ... and make sure that everybody from every part of the city of Chicago participates in the growth of O&apos;Hare." Shari Runner, president and CEO of the Chicago Urban League, said with projects like this one, "communities of color in our great city often ask, what is that going to do about jobs for me, and what is that going to do about investment in our businesses that are struggling? "So it&apos;s important to us ... to make sure that this is going to be not only a diverse workforce, but a diverse contracting opportunity for our businesses and bring some income back into our communities." But the airport expansion project is not without controversy itself. Many city and suburban residents who live near the airport have been complaining about increased jet noise under recently adopted east-west takeoff and landing patterns, and some of their elected representatives fear even more disruptive noise from the new, sixth runway. "We believe that prioritizing the construction of yet another east-west runway without first addressing the significant increases in noise that our constituents have endured since the implementation of the O&apos;Hare Modernization Program comes at the expense of our constituents&apos; health and property values," U.S. Reps. Mike Quigley, Tammy Duckworth and Jan Schakowsky, all Democrats, said in a joint statement. Despite the city spending $10 billion since 2005 building new runways and shifting to the east-west configuration to increase capacity and reduce delays, O&apos;Hare still has some of the longest delays among large airports nationwide. And some travel industry experts say what O&apos;Hare really needs is more terminal space and additional gates. "The shortage of gates is a serious issue that has to be addressed," travel industry analyst Henry Harteveldt of San Francisco-based Atmosphere Research Group told the Chicago Tribune. But United Airlines and American Airlines, which both have major hubs at O&apos;Hare and dominate the air and gate space there, have long opposed additional gates that could allow low-cost competitors, including JetBlue, Virgin America and Spirit, to add flights and gain greater market share. "That borders on anti-competitive behavior," said Harteveltd. Chicago Aviation Commissioner Ginger Evans says the deal brokered to build a new runway is a first major step toward new gates, saying, "This is the key to being able to do what we&apos;ve all been waiting for for so many years, which is to add gates to the main terminal complex at O&apos;Hare." Evans says the next step is negotiating new use and lease agreements with American and United. Current deals expire in 2018. The city expects to break ground on the new runway in May, with completion expected by 2020.